March 30, 2013 – 1:00 P.M.
Cozy’s Cafe is located at 6740 West 75th Street in Overland Park, KS 66204. This one and only American/European locale serves their entire menu of breakfast, lunch and dinner all day. They have a Facebook page, but no Twitter to our knowledge. More info can be found on their website. Location/Environment: Located at the intersection of 75th & Metcalf, Cozy’s is coincidentally a very cozy spot. Upon entering, it’s immediately apparent it’s both a very romantic and inviting restaurant. It would be completely appropriate for a small group of people or a nice place to have an intimate encounter. The mood is an ideal hybrid of American and European auras. Brick walls are accented nicely with a jukebox in the corner (non functioning, we checked). To put it short: relaxed yet formal. Menu/Selection: The menu offers a wide variety of choices, ranging from breakfast to sandwiches to European dinner entrees. All the breakfast staples are present, as well as your lunch standards (sandwiches and salads). With the entire menu being available all day, there’s certain to be an option to fit your mood. Hola, my gorgeous Panclog faithful! Today I wanted to address the elephant in the room, the fact that B&G’s have not been reviewed in our fine Panclog. 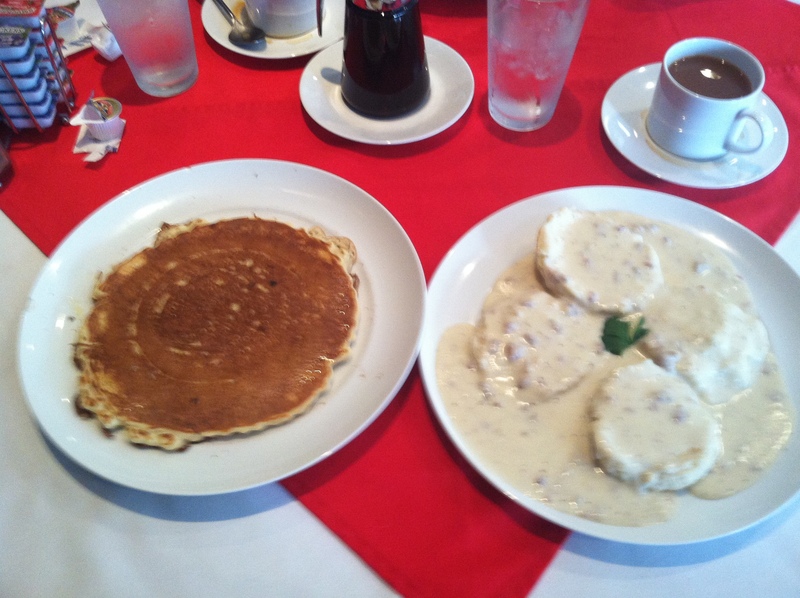 So I had a full order of Cozy’s best biscuits and sausage gravy. On the side I had a single banana pancake. 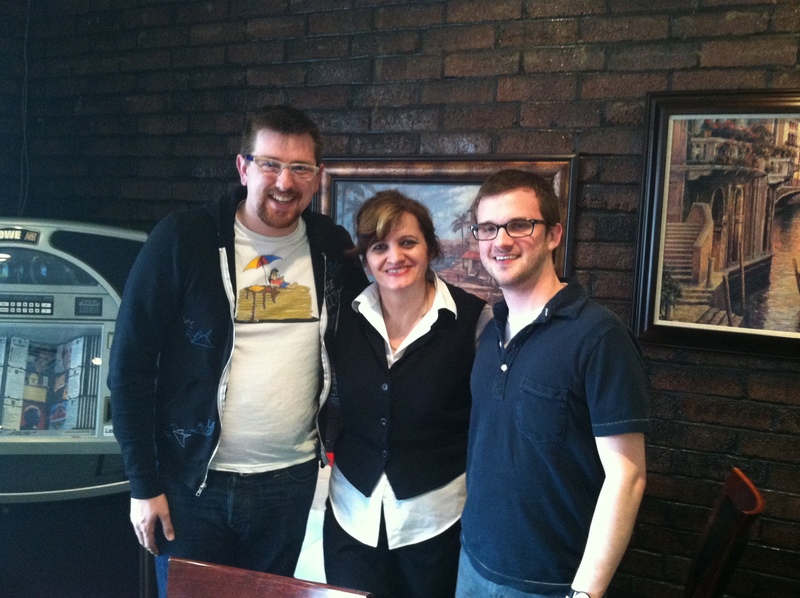 I just want to point out that Cozy was one of the best owners of a restaurant that I have ever met. She shows that she cares about every single customer that walks in. This is an incredible breath of fresh air. The biscuits and gravy were very simple. The biscuits were so fresh and soft. The sausage gravy had a very mild flavor. They lacked something. I still enjoyed every single bite of those 2 halved biscuits. I am always a fan of this very important breakfast staple! The banana pancake was quite enjoyable. Banana as an add-in to pancakes is a very safe choice. The banana flavor is very subtle, yet impactful. I could also make an argument that it is healthy! The pre-buttering of pancakes is a very interesting act. I am completely fine with it post-dining. When the pancake is pre-buttered, the butter has time to melt into your thick and scrumptious cake. These two breakfast items together made for a mighty, mighty good meal. Jumping on the pancake train once again. Grab on to the caboose, because this one was a gem. As always the french toast was tempting, but I’m trying to keep things real on the ‘clog. A full stack at Cozy’s is three cakes. 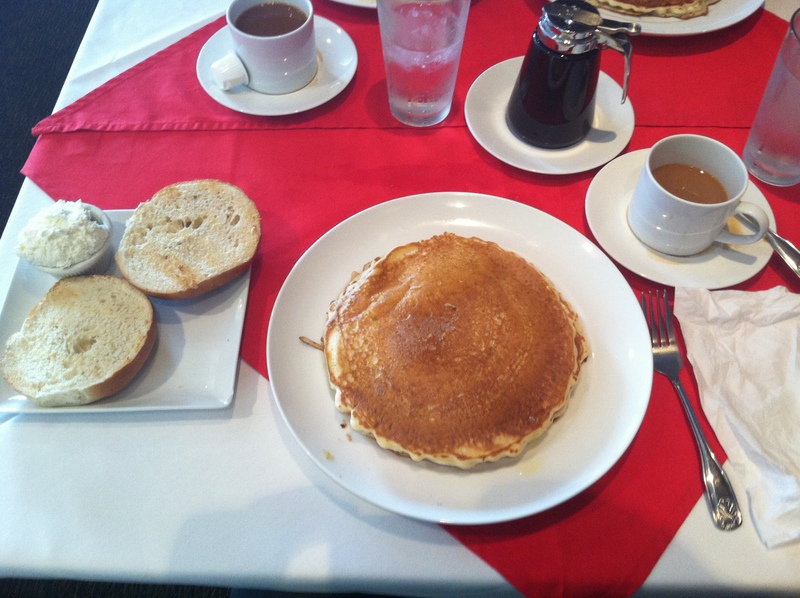 Knowing my history with not finishing pancakes, I chose to go with two flapjacks and a bagel & cream cheese on the side. The pancakes were pre-buttered which was new to me. I was wary at first, as I like to distribute my own butter, but after a little adjustment it was a nice change and I completely forgot about it by the end of the meal. The pancakes were what you’d expect, thick & fluffy. I found two cakes and a side plenty filling, as Jared even helped me finish the very last of my pancakes. The bagel was a perfect pairing for the pancakes, a nice change to jump to as I got tired of bite after bite of pancake. More than anything, the cream cheese was marvelous. Freshly whipped and in plentiful portion, it made the bagel jump from ordinary to exceptional. The coffee was the classiest coffee we’ve experienced yet. Saucers! Overall, an incredibly enjoyable meal, and with such a diverse menu, I’m already wanting to return. Price: We agreed that Cozy’s is a bit more upscale than your average Panclog cafe, and that being said, the pricing is modest for what you get. The service alone makes the price bump seem irrelevant. For the quality of the food, service and portions, you can’t beat the price. Overall: We are already talking about returning to Cozy’s to try dinner with our ladies. The food, while significant, wasn’t the best we’ve ever had, but the service and atmosphere made the trip one of the more memorable Panclogs we’ve experienced. You can follow Jared and Stephen on Twitter.